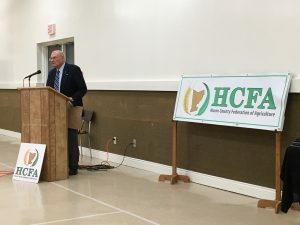 The Huron County Federation of Agriculture held it’s annual meeting Thursday night to elect their board, as well as to elect new Ontario Federation of Agriculture convention delegates and policy advisers. HCFA President Erica Murray says that in terms of agricultural issues like the NAFTA negotiations, local farmers want to see certain things maintained. Many topics were discussed at the meeting, including new tax reforms and Bill 148 regarding minimum wage. Murray says with an upcoming election, it’s vital that the province listens to the agricultural community. Regarding the minimum wage increase, Murray notes while that looks good on paper, the added costs to the agriculture sector and farmers isn’t something they’re happy with. Also at the meeting, former Minister of Agriculture Jack Riddell was inducted into the HCFA Hall of Fame. Riddell served under the Liberal government as the Minister of Agriculture from 1985-89.